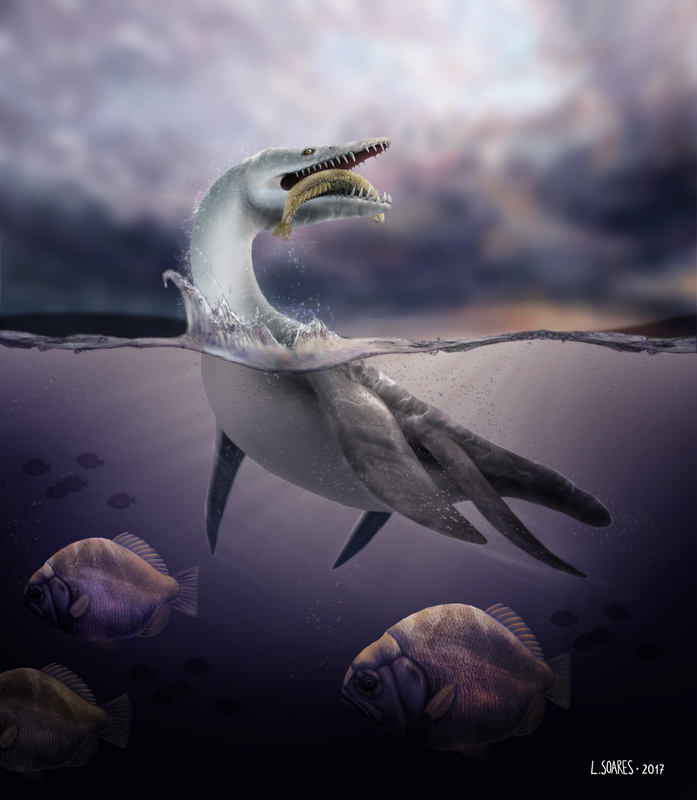 Rhomaleosaurus is the largest known Lower Jurassic pliosaur and was the top predator in early Jurassic marine ecosystems. It has a reinforced skull to help resist torsion and a ferocious set of teeth, a combination of characters perfect for snatching and killing cephalopods, fish, and other marine reptiles. Historically, the genus Rhomaleosaurus has been interchangeable with now invalid ‘Thaumatosaurus’. See my blog article Whatever happened to ‘Thaumatosaurus’? for more information on Thaumatosaurus. Several species previously referred to Rhomaleosaurus are now classified as distinct genera or junior synonyms of other species of Rhomaleosaurus. The species ‘Rhomaleosaurus’/’Thaumatosaurus’ victor (Fraas, 1910) was described as a new genus, Meyerasaurus; the species ‘Rhomaleosaurus’ longirostris (Blake, 1876) is now regarded as a separate species of Hauffiosaurus (Benson et. al. 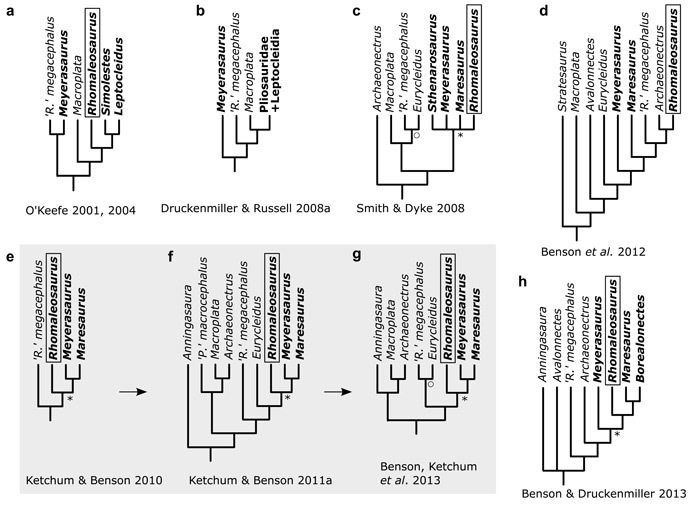 2011); and ‘Rhomaleosaurus’ megacephalus is now known as Atychodracon (Smith, 2015). 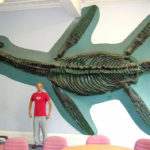 The type specimen of Rhomaleosaurus (R. cramptoni) is held in the National Museum of Ireland (Natural History) and at 7m long is the largest complete pliosauromorph ever discovered. 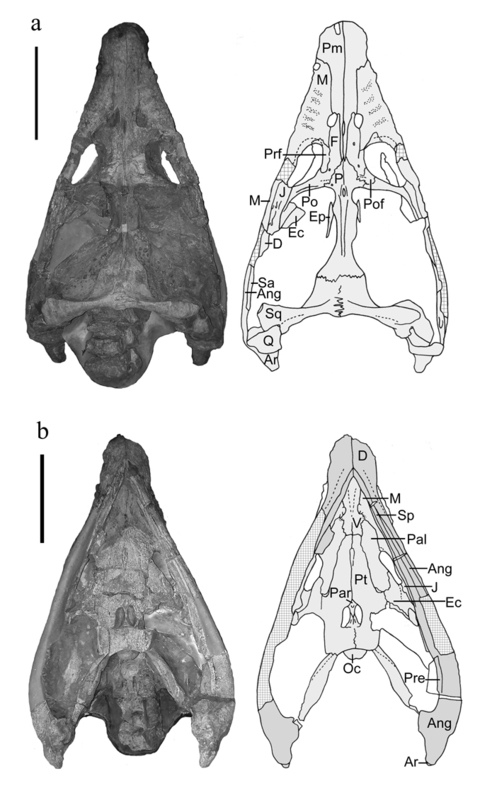 Skull of Rhomaleosaurus cramptoni in A. dorsal and B. ventral view. (scale bars = 30cm) From Smith and Dyke (2008). Skull of the holotype of Rhomaleosaurus cramptoni in the National Museum of Ireland (Natural History). Note the crates in the background – these contain the segments of body and limbs of the rest of the skeleton. Victorian model of Rhomaleosaurus cramptoni in the National Museum of Ireland (Natural History). Cast of the holotype of Rhomaleosaurus cramptoni. Taken in the Natural History Museum, London (photograph by Hector E. Rivera). 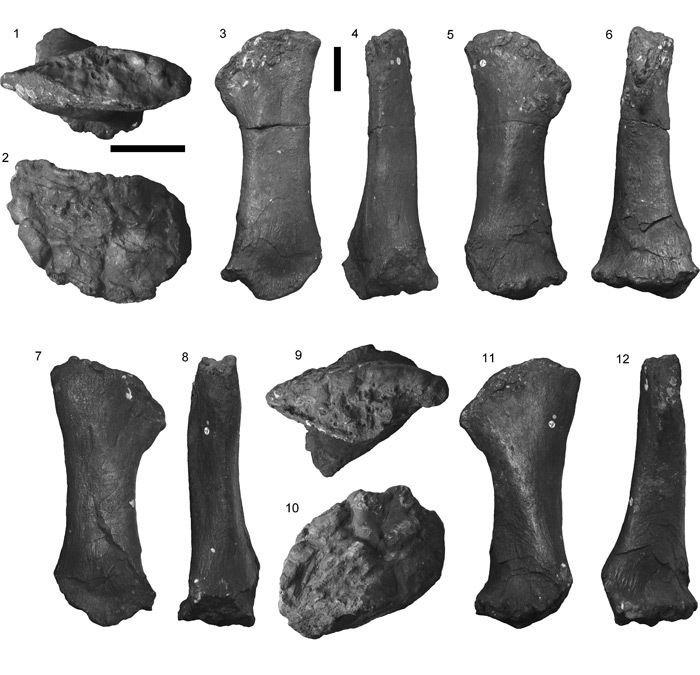 Cast of the holotype of Rhomaleosaurus cramptoni. Taken in the Bath Royal Literary and Scientific Institute. Curator Matt Williams for scale. 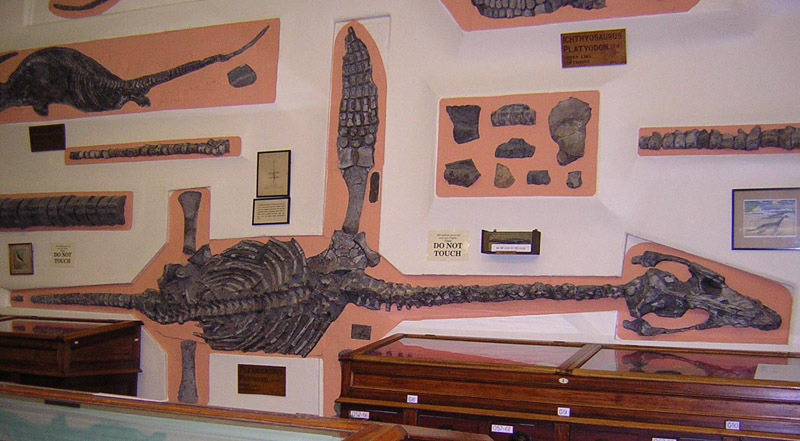 Referred specimen of R. zetlandicus (holotype of ‘Rhomaleosaurus propinquus’ (Blake, 1876) mounted on a wall of the Whitby Museum. 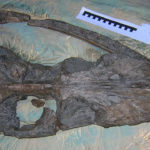 Skull of holotype of Rhomaleosaurus zetlandicus on display at the York Museum. Skeleton of Rhomaleosaurus cramptoni in dorsal view. From Carte and Baily (1963). 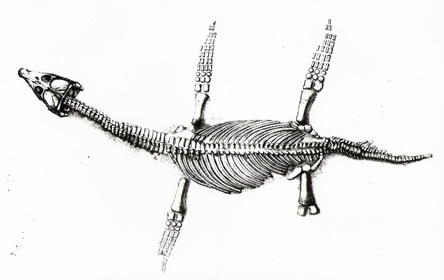 Reconstruction of the skeleton of Rhomaleosaurus thorntoni from Smith & Benson (2014). NMING F8785, a complete skeleton exposed in dorsal view. 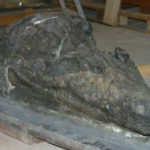 The skull is prepared in three dimensions. In 1848, the fossil skeleton of R. cramptoni was unearthed by workers in an alum quarry at Kettleness on the Yorkshire coast. The magnificent fossil was secured for five years at Mulgrave Castle, the home of the Marquis of Normanby, owner of the quarry. 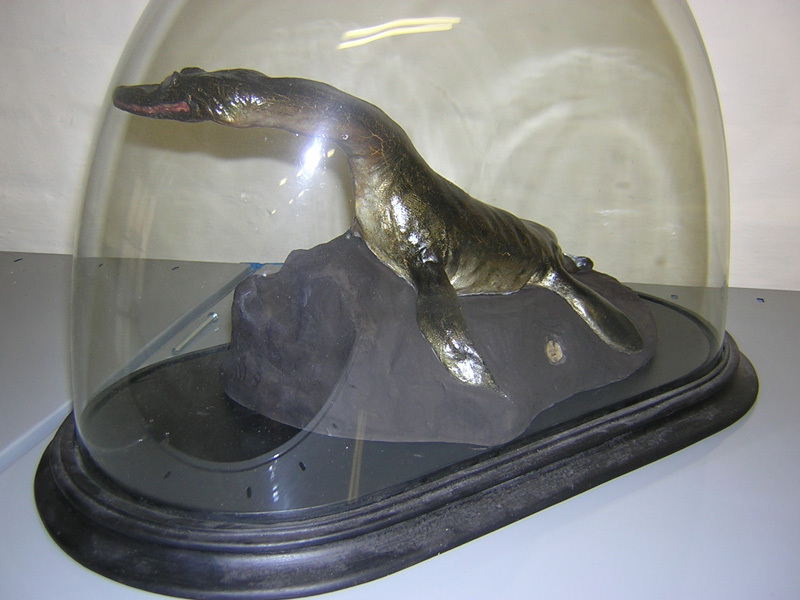 But the specimen soon moved home to Ireland. The Marquis presented the fossil to his friend Sir Philip Crampton in 1853, who brought the specimen to Dublin to display it as the centrepiece at the 1853 British Association annual meeting. 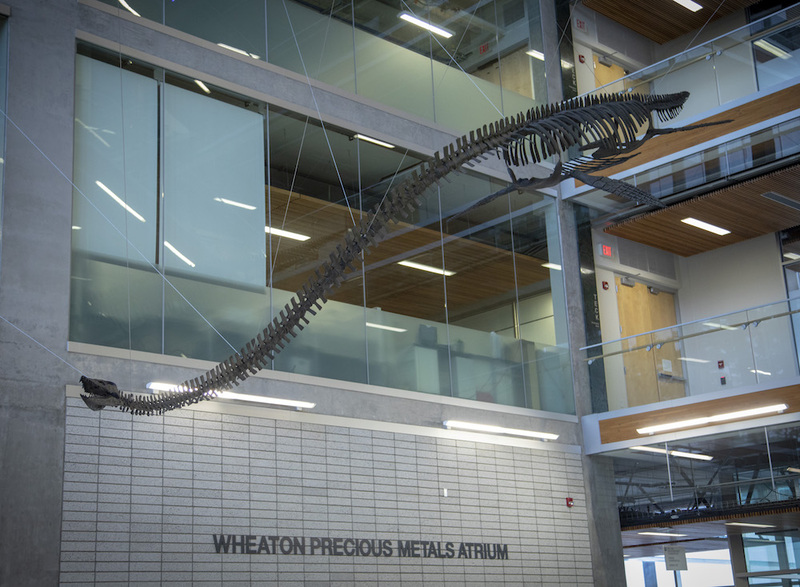 A specially constructed building was created by the Zoological Society of Ireland to accommodate the huge specimen and the fossil found a temporary home there. 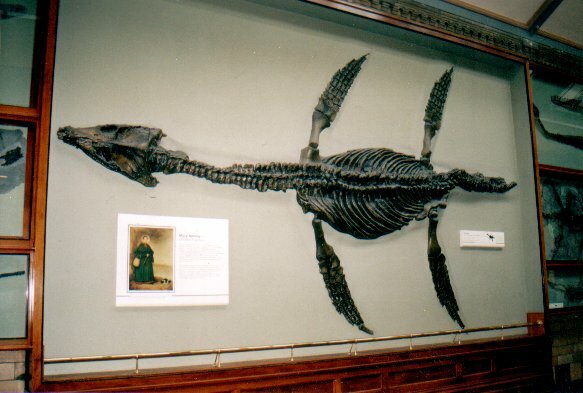 In 1863 the specimen was loaned for display in the Royal Dublin Society museum and was scientifically described and named (Carte and Baily, 1863). In 1877 the Royal Dublin Society museum was incorporated into what is now known as the National Museum of Ireland, and the ‘Science and Art Museum, Dublin’ as it was called at the time, paid 200 pounds to acquire the specimen permanently. 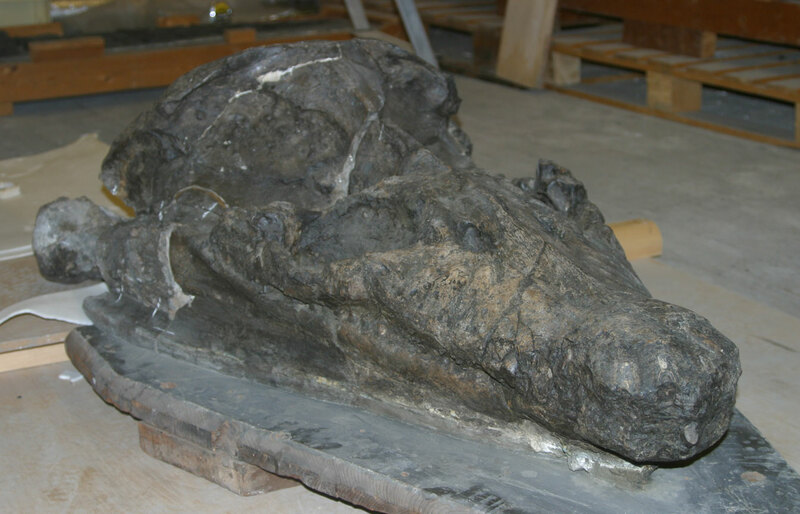 In 1890 the fossil moved again, this time into the museum’s ‘fossil hall’. But in 1962 this hall, located beside the main Natural History Museum building on Merrion Street, was demolished and the specimen was transferred into storage. 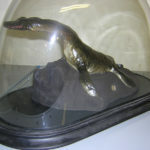 The stored collection was moved yet again in 1992 to the National Museum of Ireland (Natural History) reserve stores at Beggars Bush, where the giant reptile resided while I was conducting my PhD on the beast. A number of casts were made of the fossil throughout its history, probably purchased from Henry. A. 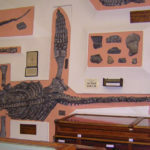 Ward, who dealt in replica fossils including Rhomaleosaurus cramptoni, throughout the late 1800s. Specimens are on display in Bath, London and New York (Smith, 2006). Many casts are unique in some aspects. Look closely (see above), and you will notice that the two forelimbs are identical copies of each other in the Bath cast. To add extra confusion, this duplicated limb is in the wrong place – it is actually a hindlimb – the two hindlimbs in the cast are really forelimbs placed in the wrong sockets. The London specimen is also unique, a new set of limbs have replaced the original ones which were mounted wrongly. 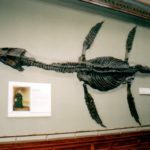 Many readers will be familiar with the giant plesiosaur on display in the marine reptiles gallery of the Natural History Museum, London. 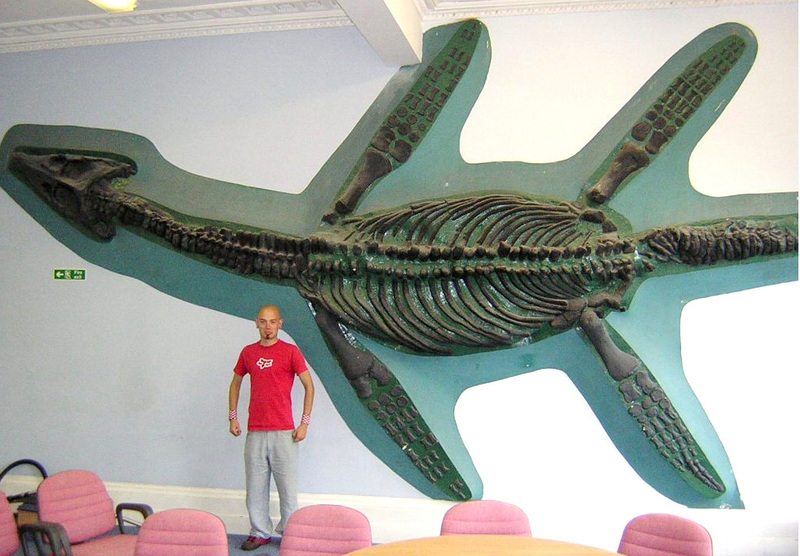 This is a cast of the 7 metre long holotype of Rhomaleosaurus cramptoni, the original of which is housed in the National Museum of Ireland (Natural History) and formed the basis for my PhD thesis back in (time flies!) 2007. However, The Natural History Museum, London, also has its very own massive (also ~7 m long) and quite real Rhomaleosaurus type specimen to rival the ‘Dublin Pliosaur’ in size. NHMUK PV R4853, the mighty Rhomaleosaurus thorntoni, is from the Toarcian (Lower Jurassic) of Northamptonshire. It was donated to the museum prior to 1922 but has never been described and figured in its entirety before. The entire manuscript, including the photographs and figures, is completely new: this is not a rehash of my PhD thesis on Rhomaleosaurus. The skeletal reconstruction is brand new as well and I hope that it comes to replace my previous reconstruction of Rhomaleosaurus in time, which I was never completely satisfied with (figured in Smith , Smith & Dyke , and Smith ). 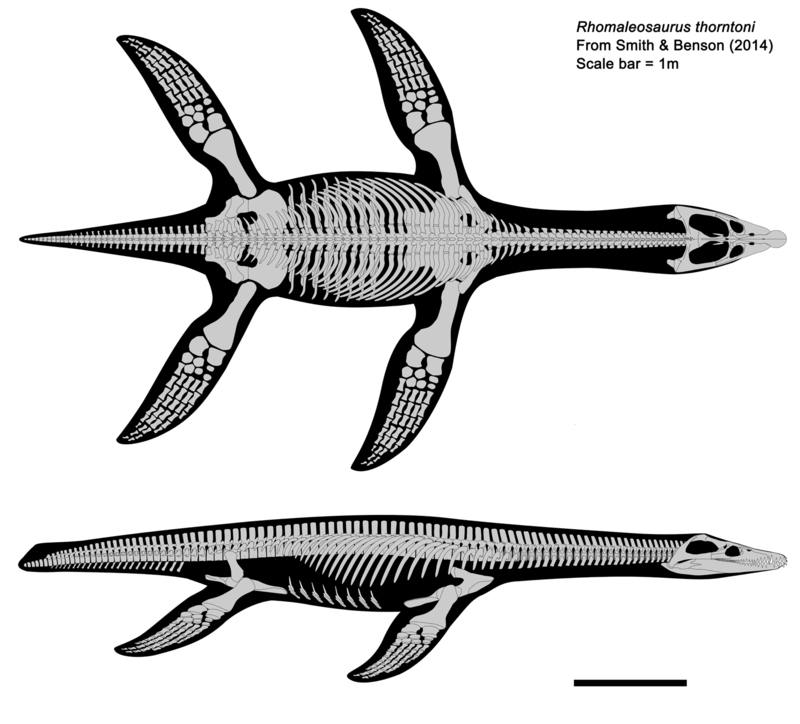 It is important to highlight that the new reconstruction represents R. thorntoni specifically, which we demonstrate is a distinct species, whereas the previous reconstruction represented Rhomaleosaurus sp. using R. cramptoni where possible and R. thorntoni as a proxy where not. As such, the original reconstruction was a mishmash of two different species, with related scaling errors. Most of the differences apparent between the new and old reconstructions are, however, due to stylistic improvements and a greater attention to detail, rather than genuine anatomical differences between R. cramptoni and R. thorntoni. 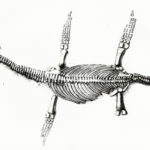 The lateral view, especially, had some perspective issues with the ribs and limbs, which are corrected in the new reconstruction. There is still some margin for error in the proportions of the tail and neck in the new reconstruction because these are incomplete in the holotype (and only known specimen) of R. thorntoni, but I’m much more satisfied with it. Rhomaleosaurus thorntoni reconstruction. Scale bar = 1m. There is some doubt over the systematic position of rhomaleosaurids. 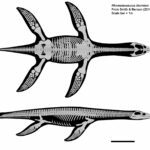 They are traditionally regarded as pliosaurs, but they might not really be included within that clade, so for this reason we refrained from referring Rhomaleosaurus to Pliosauroidea in the title. We don’t include a cladistic analysis in our monograph to investigate this question, but we do summarise all previous ones and identify areas of relationship consensus within the clade Rhomaleosauridae. 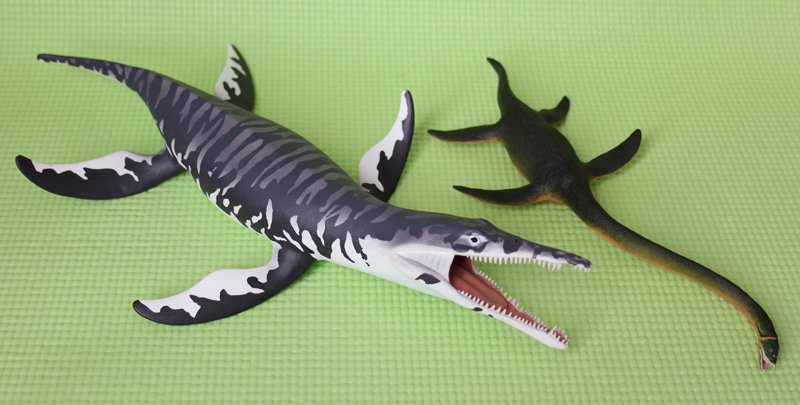 More cladistic work is required to confirm whether rhomaleosaurids are an early plesiosaurian offshoot, or pliosaurs proper. So, where’s the PDF? Sadly, there isn’t one, and this has been discussed and debated in some detail over at SV-POW (here). I say ‘there isn’t one’, but what I really mean is that distribution of the PDF is forbidden, since a beautiful PDF does exist (I was annotating it in the final proof stages). I was hopeful that permission would be granted for me to share the final PDF along with the hard copies provided for authors to distribute, but it was not to be. Of course, I’m disappointed about the barrier this puts between my research and potential readers, and I’m concerned about the impact this might have on it being cited. However, the hard copy is a quality publication, which can be thought of as more of a book than a paper. Those individuals that require it for research purposes can always request one from me directly – I can’t make promises but drop me an email if you have a serious interest ([email protected]). The Palaeontographical Society funded some of my visits to the Natural History Museum to see the fossil material and this influenced my decision to select the Monograph of the Palaeontographical Society as a publication venue for this work. Plus, the format suits such an exhaustive treatment. I’d like to thank the editor, Yves Candela, who made a significant contribution to the volume and coordinated the whole process. Update: The monograph is now available for sale from the Pal Soc website here. Smith, A. S. 2007. Anatomy and systematics of the Rhomaleosauridae (Sauropterygia: Plesiosauria). PhD thesis. University College Dublin, 278pp. Smith, A.S. 2013. Morphology of the caudal vertebrae in Rhomaleosaurus zetlandicus and a review of the evidence for a tail fin in Plesiosauria. Paludicola 9 (3): 144–158. Smith, A.S. and Dyke, G.J. 2008. 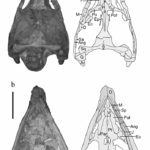 The skull of the giant predatory pliosaur Rhomaleosaurus cramptoni: implications for plesiosaur phylogenetics. Naturwissenschaften, 95, 975-980. Smith A.S. and Benson R.B.J. 2014. Osteology of Rhomaleosaurus thorntoni (Sauropterygia: Rhomaleosauridae) from the Lower Jurassic (Toarcian) of Northamptonshire, England. Monograph of the Palaeontographical Society, London: 168 (642), 1–40, pls 1–35.